Last week, we showed you a crazy video of two guys wearing jetpacks flying alongside an Airbus A380, and now we’ve got another jetpack related story. Seriously, what are the odds of that? 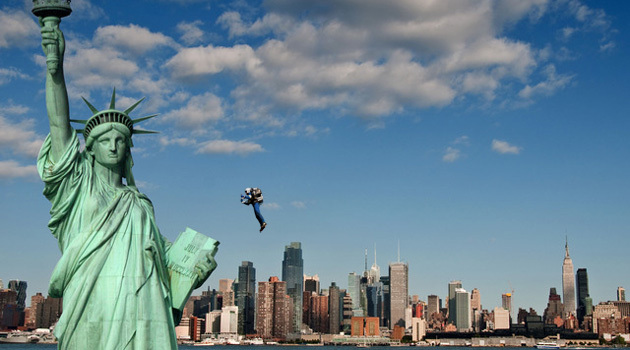 Jetpack Aviation’s CEO David Mayman took out the JB-9 jetpack on it’s maiden flight over the Hudson River and past the Statue of Liberty, which you can see in the video below. The JB-9 is said to be the world’s first personal jetpack, and it’s already approved for flight by the FAA and the Coast Guard. The company claims that the JB-9 is fast, powerful, safe and practical. It is small enough to fit in the back of a car, yet powerful enough to reach upwards of ten thousand feet. The jetpack can take off and land vertically, hover and cruise. Growing up watching The Jetsons, I always dreamed of being able to fly through the air. Now it seems like that might become a reality, and sooner than we thought!